Fasting is one of the oldest known health therapies. Throughout history, various cultures and religions have embraced the value of therapeutic fasting. Ancient Greek literature, the Koran and the Bible all make various references to fasting. The Bible mentions fasting on 74 different occasions. Moses fasted forty days and nights before receiving the Ten Commandments and Jesus fasted 40 days in the desert prior to starting his ministry. Hippocrates, the father of medicine, routinely recommended prolonged fasting. Pythagoras (c582-c500), a famous Greek philosopher, would not accept a potential student until they had fasted for 40 days. Even Benjamin Franklin often proposed that “the best of all medicines are rest and fasting.” Evidently the benefits of a fast have been recognized for thousands of years. Although research exists from the late 1800s on fasting, it remains a subject of limited study within the medical and scientific community. Fasting typically refers to the abstinence from food and drink except water for a specific period of time. But there are many variations depending upon the goal of the fast. There are fruit fasts, juice fasts and vegetable fasts. The fasting process spares the essential tissues (e.g. vital organs) while utilizing non-essential tissue (e.g. fat) for fuel. Alternatively, starvation utilizes essential tissue for energy. During starvation, the body uses protein from organs and muscles to function, since fat stores have been depleted. 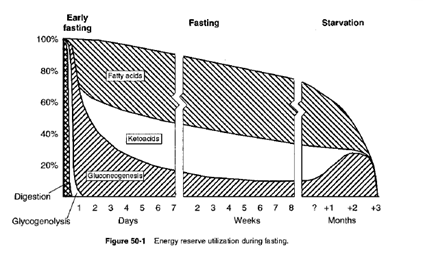 The following figure describes the stages of fasting. Glucose (sugar) is synthesized by the liver during the initial lack of food. The liver stores of glycogen are depleted in the first few hours to make glucose (glycogenolysis). Afterwards glucose is generated (gluconeogenesis) from amino acids in the liver and muscle. Fatty acids (triglycerides) are the main energy source during fasting. Certain metabolic processes however do require amino acids for fuel causing protein stores to be broken down. A 160-pound man could safely fast for up to 2-3 months before starvation sets in. Once fat reserves are depleted and significant protein is used for energy production starvation can result. Protein stores are adequate for only a few weeks (gluconeogenesis). Eventually essential proteins are utilized and death can occur. Food is required after maximum fasting period (several weeks to months, dependent upon fat stores, metabolism and activity) to prevent Stage 3. Research has shown the benefit of therapeutic fasting for a variety of conditions including: diabetes, high blood pressure, obesity, cardiovascular disease, dermatological ailments, gastrointestinal disorders, arthritis, allergies, mental illness and chemical poisoning. At the University of Minnesota in 1950, 32 volunteers fasted for 8 months. In comparison to food deprivation cases during World War II, the observations confirmed that the fasting period did not lead to any deficiencies in vitamins or minerals. Improvements did occur in diabetes and skin ailments. Fasting alone was recommended in the treatment of mild to moderate acute pancreatitis following a random trial of 88 patients in 1984. In 1984, the American Journal of Industrial Medicine studied patients who had ingested rice oil contaminated with PCB’s (polychlorinated biphenyls). Following a 7-10 day fast, subjects reported symptom improvement. Caution was noted with patients known to suffer from significant contamination of fat-soluble toxins as toxic levels may be reached in the bloodstream. (i.e. DDT, dichlorodiphenyltrichloroethane, is mobilized into blood during a fast and may lead to toxic levels to the nervous system). Further literature has suggested the benefit of fasting to: eczema, psoriasis, IBS, depression, schizophrenia, ulcers, fibroids, autoimmune disease, etc. What can be expected during a fast? Fasts are individualized and can vary in length from 3 to 7 days. In general, in the first 1-15 days as the body uses up glucose, hypoglycemic reactions can occur. The severity can vary and symptoms may range from nothing at all to feeling lightheaded or faint to mood swings, to headaches and body aches. After glucose stores have been exhausted and the body begins to mobilize fat, the extent of fat soluble toxins present in the body will directly correspond to the symptoms experienced. The majority of harmful materials are either fat or water-soluble. Water-soluble toxins are eliminated by the kidneys. The fat-soluble toxins are predominantly removed by the liver. The body is continuously exposed to chemicals in food as preservatives and stabilizers or as pesticides on the surface of fruits and vegetables. Pesticides and herbicides are generally fat soluble so they attach to the plant and do not wash off in the rain (as water-soluble do). The fat-soluble toxins concentrated in the liver and cells are mobilized during the fast. The greater the amounts the more prolonged and severe your symptoms may be. Feeling ill from detoxification could last for 2 to 5 days depending upon the fast. The symptoms during toxin elimination are equivalent to a healing crisis. Imagine your blood with food molecules in it. As you start fasting the food molecules are consumed. The cells without food utilize the stored glucose and then metabolize fat for fuel, simultaneously mobilizing fat soluble toxins. Initially the liver and kidneys are overwhelmed by the burden placed on them (the bodies symptoms of brain fog, headaches, bloating and pain are all a reflection of this). Once the liver and kidneys begin to catch up, symptoms subside, energy increases, mental clarity improves and there is frequently a strong sense of well-being. A feeling of euphoria is often expressed from those who chose to meditate or pray during their healing journey (this is commonly the religious benefit of fasting). Supplements are prescribed to accelerate the detox process in order to achieve faster results. There is often a concern of whether sensations of hunger will be experienced throughout the fast. Intense hunger usually lasts for the first few days followed by almost no hunger at all. Incidentally, those who attach a high social and psychological stigma to food can find the fast quite difficult. Therapeutic fasting is advantageous for disease management and prevention. To attain optimal health fasting once a year for more than three days is recommended until good clarity of thought, energy stability and decreased symptoms are achieved. It is advised to consult a licensed practitioner well versed in fasting protocols for your first endeavor.